Now, while the stuff that I was talking about in the last entry might be interesting, it wasn't really what our excavation focused on this season; the two squares with the majority of the volunteers were on the east side of the area, and while my square was on the west, most of what we dug was huddled up against the eastern edge of the square. No, while the stuff on the west looks a bit different than it did at the beginning of the season, the stuff in the east looks a lot different than it did at the beginning of the season. And we certainly learned a great deal of what had been going on there, at least during the Byzantine period. As with the last entry, MS Paint has been used in an attempt to clarify. This picture more or less picks up where the picture in the previous post leaves off; the wall that I've circled in red and labeled 2 matches the wall in the previous post that I had circled in red and labeled 1; the wall that I circled in black here and labeled 1 matches up with the one that I had circled in green and labeled 2. Sometimes I make peculiar choices. But anyway. The wall labeled 2 is earlier than any of the other features that can be seen in this picture, and was probably the wall of the apse of a Roman basilica. The wall labeled 1, on the other hand, was built later, and does not seem to have been part of a basilica at all. One of the things that troubled us at the end of last season was the plaster structure which I've circled in green, and labeled 3; only a bit of it was visible at the time, so interpretation of it was postponed until this year. Thus, the wall I labeled 1 would have been the rear wall of the odeon's seating, and the wall that I've circled in yellow, and labeled 4 would have been part of the banking of the odeon's seating -- the seats on our side would have been over the top of that wall, and the next block of seats would have continued from that level down. Or, depending on the size of the orchestra, that might have been where the performers would have stood; it's hard to tell without excavating more of the material to the north. 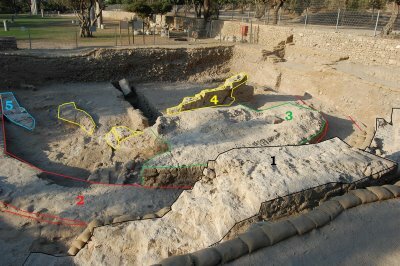 How the wall that I've circled in blue and labeled 5 fits in isn't entirely clear; it might have been a rebuild of the basilica that took place before the odeon was built. Whatever it was, it's covered over by the remains of the odeon, which means that it came before it. And that is, more or less, what we've found in Grid 47 this year. But I've got at least one more post that I'd like to make; hopefully, we'll get to that tomorrow.